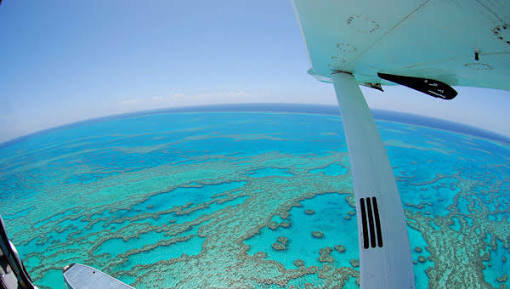 Enjoy our extensive 3 days, 2 nights on Fraser Island itinerary before embarking on a light aircraft flight over one of the natural wonders of the world, Great Barrier Reef to the beautiful Lady Elliot Island where you can enjoy an overnight stay, snorkel the reef, see the underwater sights in a glass bottom boat tour, or arrange a scuba dive. We head out of the Brisbane driving north through the Sunshine Coast, Glasshouse Mountains and Noosa. We travel via 4WD (tides permitting) on Noosa North Shore and Double Island Point. The coloured sands of Rainbow Beach on our right and Fraser Island on our left. With your local guide and driver stop for an early Lunch at Rainbow Beach. Take time to relax, visit the local beach, take a swim overlooking coloured sands or wander through local shops. After breakfast this morning, the first stop is Lake McKenzie. 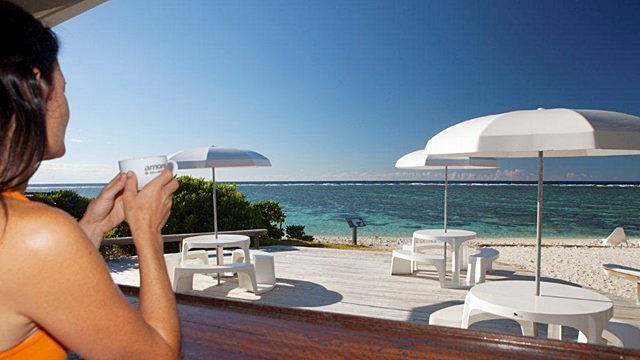 Sunbake, explore or chill and relax on the lakes perfect white sands and swim in the pristine fresh water. After drying off we make our way to the cool of the rainforest. Here you will take a boardwalk along the crystal clear waters of Wanggoolba Creek, spot fresh water eels, see magnificent rare giant King Fern and experience the unique world heritage Satinay Forest. Then take a hike through tropical rainforest at Central Station along the banks of Wanggoolba Creek to Pile Valley. Depart Fraser Island via Hervey Bay Sea Ferry, see the west coast of Fraser Island and the Great sandy straights. 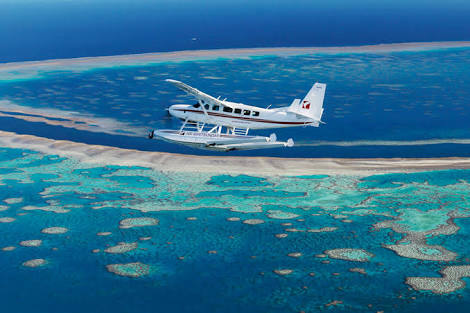 Arrive Hervey Bay Airport for your charter flight across the Great Barrier Reef, arriving Lady Elliot Island - "Southern Great Barrier Reef." 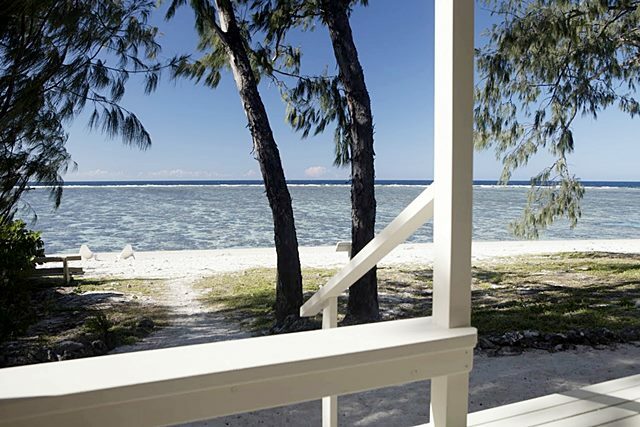 Once checked in, why not go for a swim, or enjoy a reef walk? Reef walking is a great way to explore the reef in the Lagoon at low tide with the assistance of reef walking poles and seascopes. You can get up close and personal with the marine environment and discover a myriad of marine creatures including sea cucumbers, starfish, sea urchins, coral, clams, crabs and colourful fish of all shapes and sizes. Guided reef walks are offered daily, tides permitting. 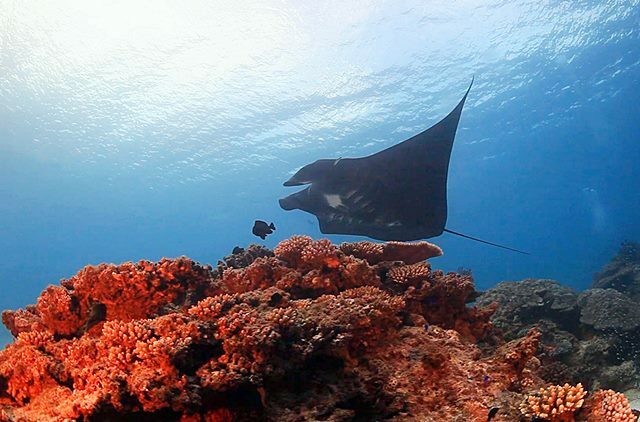 You will see a multitude of marine life as our experienced guide introduces you to the complexities of the reef eco-system and many creatures and things of interest that you might otherwise have walked straight past. Lunch can be purchased at the Beach Front Cafe at the Resort (between $10-$20). For those in search of games to pass the day away, the Eco Resort offers beach volleyball, soccer, table tennis and a pool table. A small selection of DVD's, books and board games are available in the Manta Lounge. 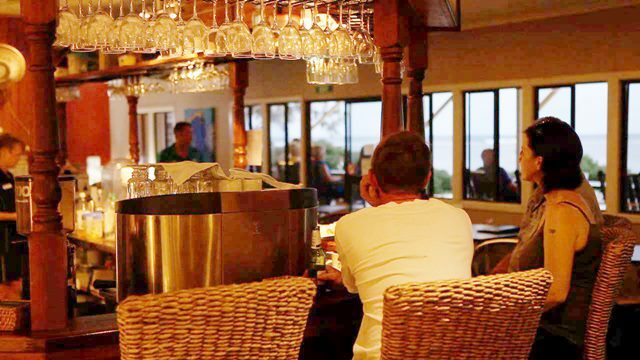 Enjoy your buffet dinner while you watch the sun go down over the Great Barrier Reef. Island Whispers – Make your way to the lagoon bar at 6:00pm nightly for the gossip of the day and to book in for tomorrow's watersport activities. Night Stalk – Feeling adventurous? Discover Lady Elliot Island by night! Find our nocturnal animals and learn about our resident ghost on the island (bring your torches). Quiz Nights/ Bingo and Games Evenings – Come along to the Lagoon Bar as we put you to the test and see how much you have learnt during your stay on Lady Elliot Island. An entertaining evening for all ages with the games on offer rotating throughout the week. 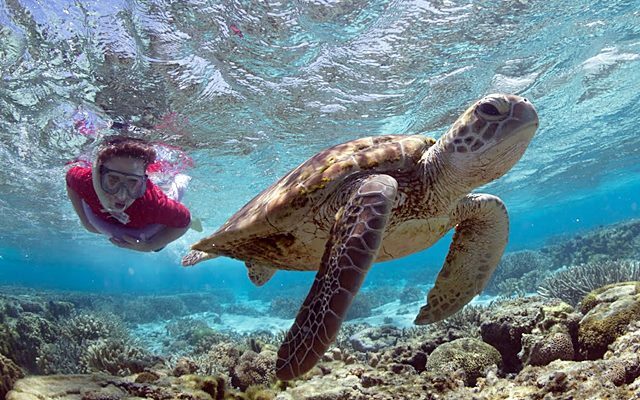 Evening Presentations – Learn more about the Great Barrier Reef and Lady Elliot Island during our evening presentations in the Reef Education Centre. The presentations on offer rotate throughout the week. Star Gazing – Enjoy our spectacular night time skies as you lie on the airstrip and gaze up to the heavens. Bring along your favourite nightcap and pillow. Lunch can either be purchased at the Beach Front Cafe or you can treat yourself to a buffet lunch ($18.00 per person). Fish Feeding – An amazing array of reef fish appear at the ‘fish pool’ every day. 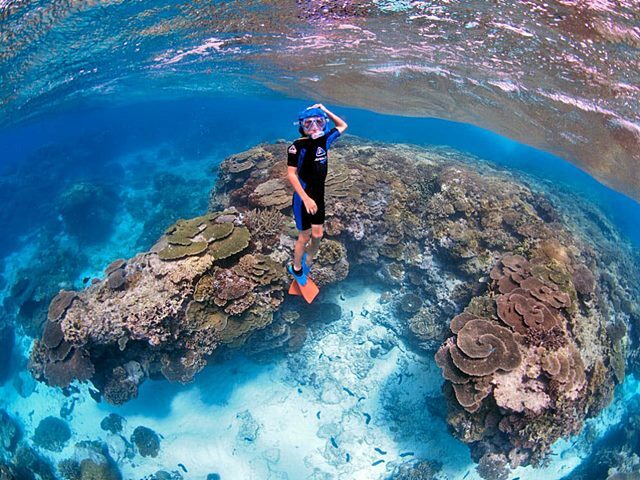 Come with your reef walking shoes and immerse yourself in this awesome experience. Your guide will enlighten you regarding the fish and the way we feed them within the Marine Park. Duration 15 minutes. Bird Watching Tour – A huge variety of seabirds, land birds and migratory waders may be seen across our picturesque island. The Crested Terns lay their eggs in the open, while Bridled Terns and Silver Gulls prefer to nest under shrubs. Black-Naped Terns are also common on the island along with the spectacular Brown Boobies, lesser Frigate Birds and a small colony of Red-Tailed Tropic Birds. 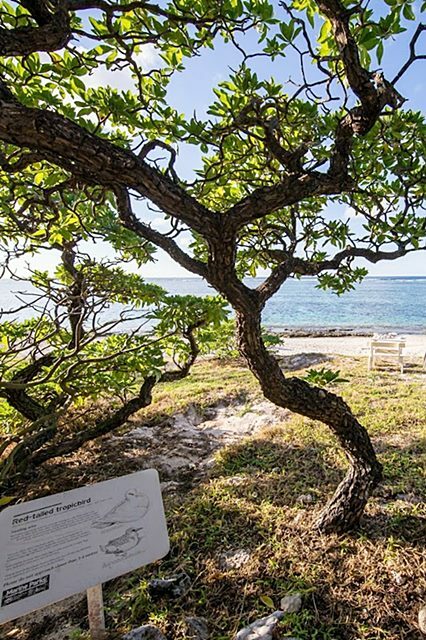 On this 45min walk find out why Lady Elliot Island is an ornithologist's delight! Historical Tour – Step back in time to the years of the guano miners and lighthouse keepers. Find out how the Island has developed into what it is today. Behind the Scenes Tour – Ever wondered where the water you are drinking comes from? What about where the water from the shower goes and how we get electricity for the accommodation 80km out to sea? Come behind the scenes with us for 45 minutes and learn how an Eco Resort is run. All good things must come to an end, and you will now be boarding your 4:00pm flight back across the Great Barrier Reef to Hervey Bay airport, where our friendly staff will meet you and transport you back to Brisbane while you sit back and relive an amazing four days of activities unlike anywhere else in the world. "We had an amazing time on both Fraser and Lady Elliot Island. The Sunrover staff organised everything for us and we really had nothing to worry about which made the trip truly enjoyable for us as we've only had a few days and soooo many things to see. I highly recommend visiting Lady Elliot Island especially for divers or those who love snorkelling. I already dived quite a lot in the Great Barrier Reef in different places but Lady Elliot is very special. This time I could only do snorkelling as we were flying again the next day but NO REGRETS!!! Just snorkelling I've seen much more sea life than in may other places I scuba dived before. From all kind of sea turtles (from little green turtles to swim with to 1m big Loggerhead), reef sharks, octopus, clownfish, parrotfish, barracuda, eel and all kind of beautiful coral. Unfortunately we didn't see the Manta Rays as it wasn't the season but next time ;) The Lady Elliot Island Eco Resort is fantastic. It's a private Island and only a number of people can stay there. You really feel special when you arrive in the little plane on the island and receive that lovely welcome from the staff members. The food buffet is amazing and the cabins are in an excellent state. Everything on the Island can be done in walking distance and it feels like you're lost in paradise just you and the beautiful sea life. I absolutely loved staying there and will surely come back one day!!!!" Lady Elliot Island (LEI) is a coral cay situated at the southern tip of the Great Barrier Reef. 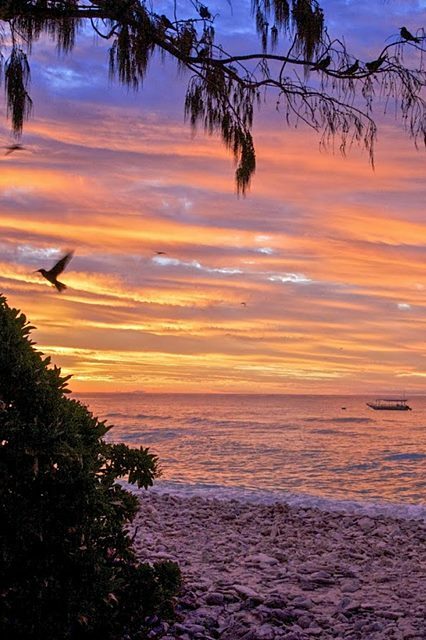 We are located approximately 120 kilometers north-east of Fraser Island. Lady Elliot is the closest Great Barrier Reef island to Brisbane, Queensland’s southern capital. The Island lies within a Marine National Park ‘Green Zone’ and forms part of Australia’s World Heritage Listed Area on the Great Barrier Reef. Lady Elliot is only 42 Hectares (100 acres) in size, small enough to walk around in 45 minutes. As Lady Elliot Island is a coral cay, it is made entirely from crushed coral, the beaches and other pathways can be hard on your feet. Please ensure that you bring comfortable walking shoes or reef walking shoes (covered toes), as this will make your stay more enjoyable (we do have some reef shoes that our guests can borrow if you don’t have your own, however, sizes are limited). The waters surrounding Lady Elliot Island are exceptionally clear all year around with an average visibility of 20+ metres. As the Island is located way out on the outer edge of the continental shelf and not close to the inshore rivers and runoff that comes after rain, we enjoy clean and clear waters and healthy coral. Being on the southern end of the Great Barrier Reef and 80km from the shore we don’t get any marine stingers so no need to wear those lovely stinger suits! 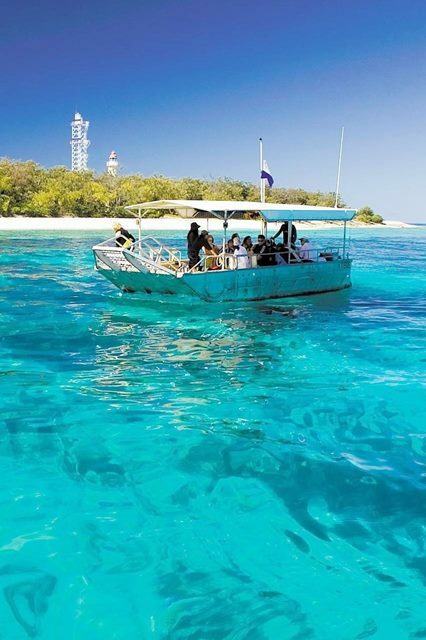 Lady Elliot Island is regarded as one of the best snorkelling and diving destinations on the Great Barrier Reef. 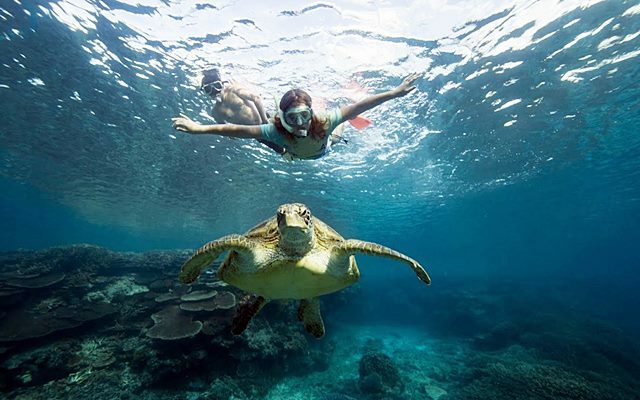 The Island is situated within the highest protection zone of the Great Barrier Reef and is a haven for marine life including manta rays, turtles, whales, dolphins, sharks and the entire cast of ‘Finding Nemo’ – over 1,200 different species of marine life can be found around the Island. 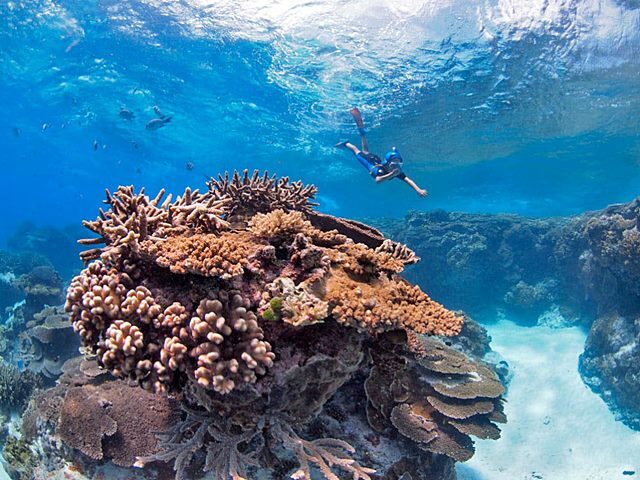 From beginners to advanced snorkellers or divers, you will experience the true wonder of the Great Barrier Reef without the need for a long boat trip. 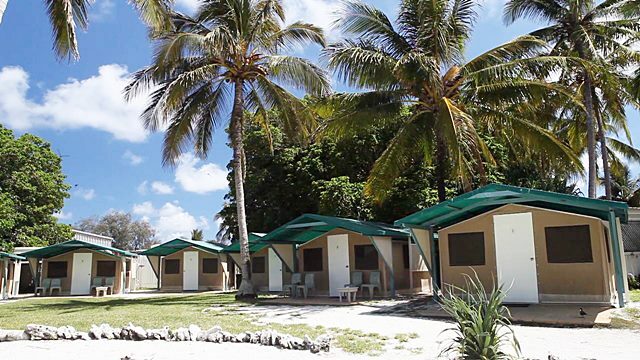 Situated within 20 to 30 metres of Sunrise Beach, the Eco Cabins are roomy, permanent safari-style tents with polished wooden floors and shared bathroom facilities. 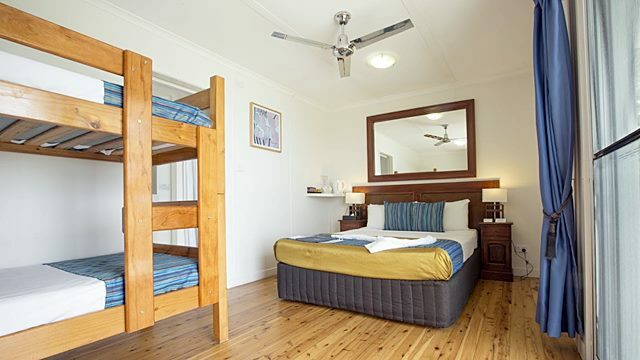 Each hut accommodates four people with two sets of single bunk beds. Electric lighting and power is connected in every cabin, including a freestanding fan. Camping equipment, mattress, sleeping bag, Fully set up camp site, under cover areas, power to charge phones and camera's. Fenced Campsite on Fraser Island, 50 metres from the 75 Mile surf beach. Local guide/Driver. 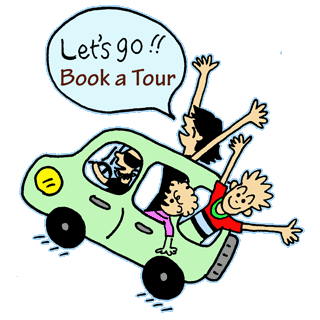 Fully guided tour (3 days). Picnic Lunch at Island highlight - Cold drinks, cold meats, picnic salad, fresh fruits, cakes, wraps and bread rolls. Dinner - BBQ herbed fish, smoked cod, garlic bread, salads and cold drinks. Day 2 - Buffet breakfast at Kingfisher Bay Resort - Dingo Bar, tea coffee, fruit juice, cereals and toast, jam, honey, fruits. 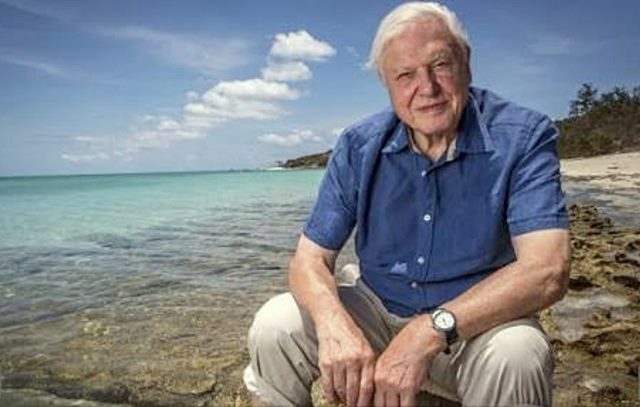 David Attenborough at Lady Elliot Island. For certified divers, scuba can be arranged upon arrival to Lady Elliot at own cost.